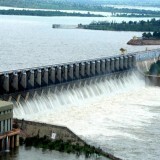 Almatti Dam is the fundamental store of the Upper Krishna Irrigation Project; the 290 MW control station is situated on the correct side of the Almatti Dam. The office utilizes vertical kaplan turbines: five 55MW generators and one 15MW generator. Water is discharged in to the Narayanpur repository in the wake of utilizing for power age to serve the downstream water system needs. Amid the underlying phases of the undertaking, assessed costs were anticipated as Rs.14.70 billion, yet following the exchange of venture's administration to the Karnataka Power Corporation Limited (KPCL), the evaluated expense was diminished by more than 50% to Rs. 6.74 billion. The KPCL inevitably finished the undertaking at an even lower cost of Rs. 5.20 billion.The whole dam was done in under forty months, with development finishing off with July 2005. The dam is situated on the edge of Bijapur and Bagalkot locale. Topographically, it is situated in the Bijapur district,but vast territories of Bagalkot region have likewise been submerged because of filling of the reservoir.The dam holds a gross water stockpiling limit of 123.08 TMC at 519 meters MSL.